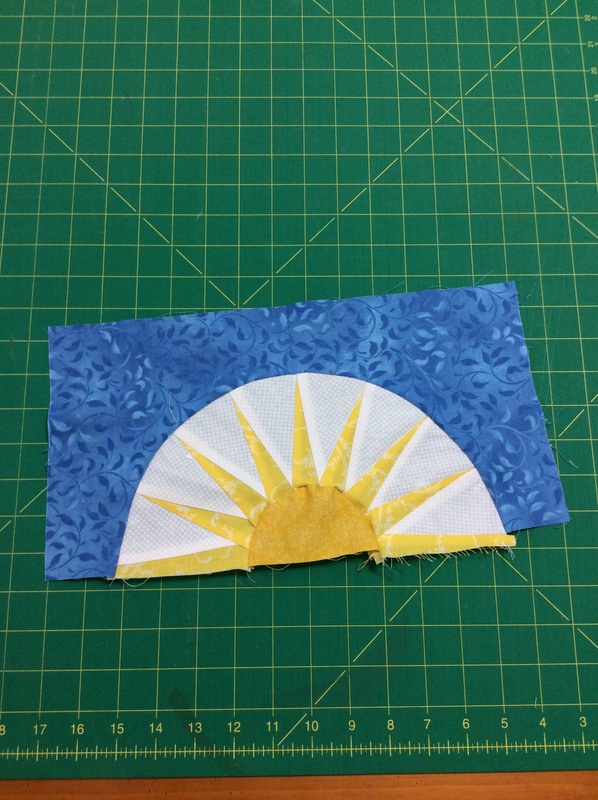 I was putting together the blocks for the 2014 Mod Mod Sampler from Block Lotto, and here is my epic fail at sewing curves. I have successfully made Drunkard’s Path blocks with quarter circles, but these semi-circles were too much. I needed to come up with something else for that space in the quilt. I looked at some traditional blocks, but this is a Modern Modular design. So I improvised, first trying string piecing. 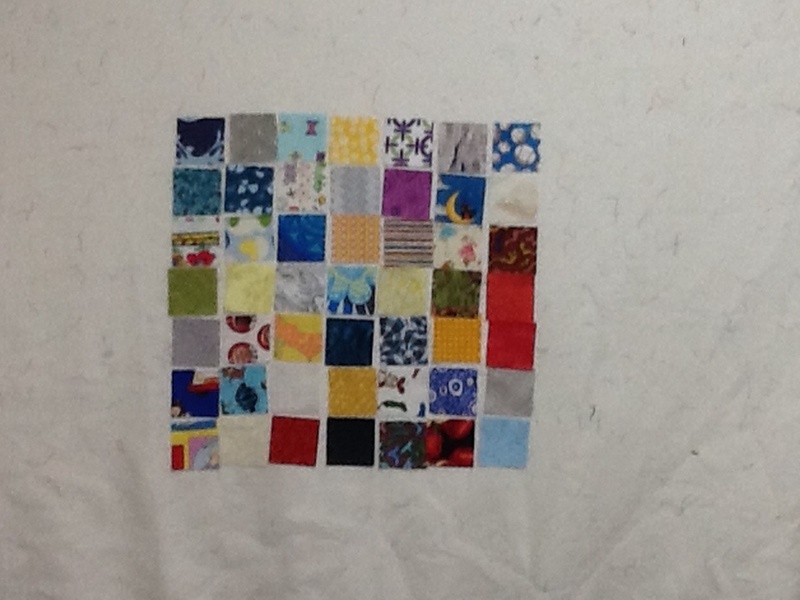 Then I turned to my favorite bit of quilting, the 2-1/2″ square. 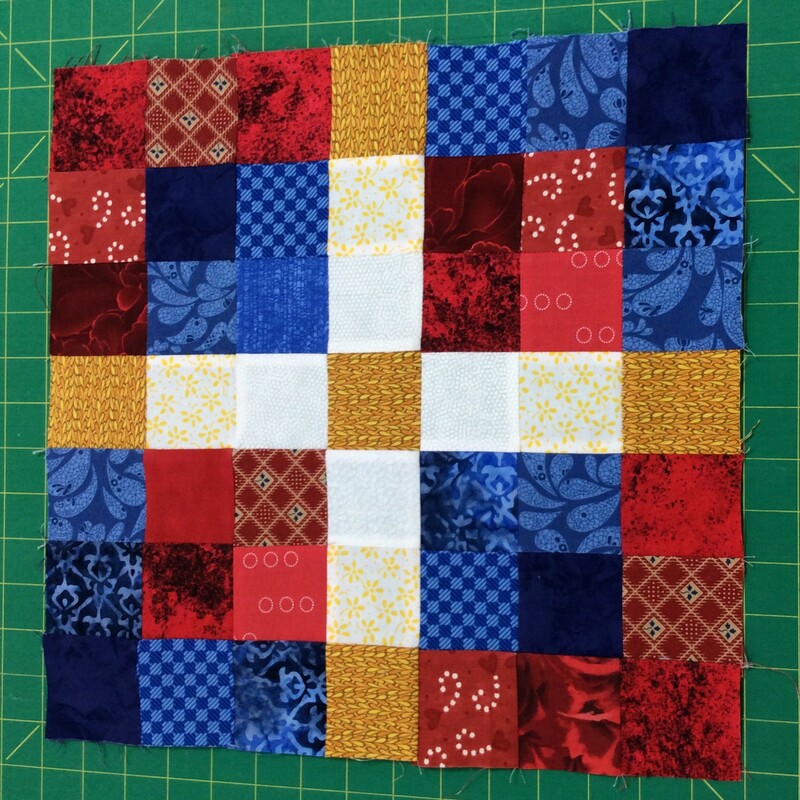 I had a stack of red and blue squares and I needed a 7×7 grid to make my 14″ block. Here is the arrangement I came up with. Now I just need one more 14″ block and I can finish the sampler. 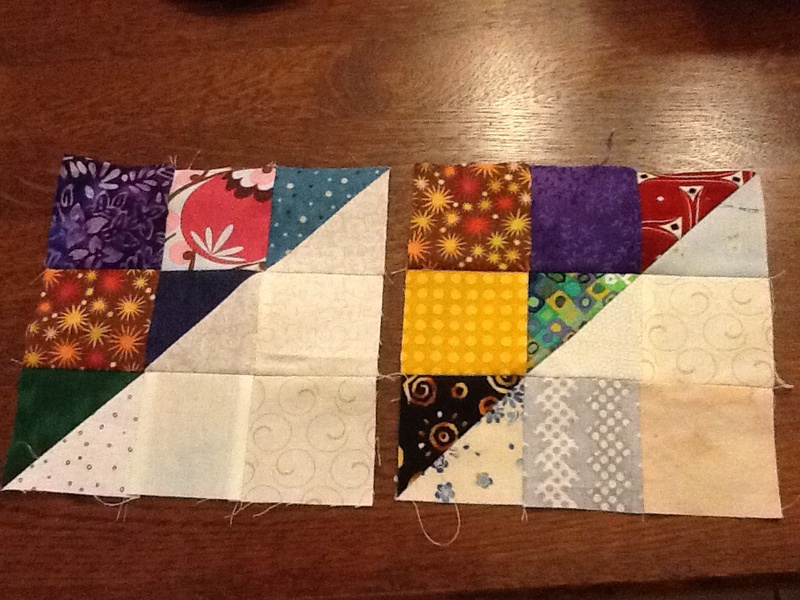 I keep sewing the split 9-patch as my leader-ender project. 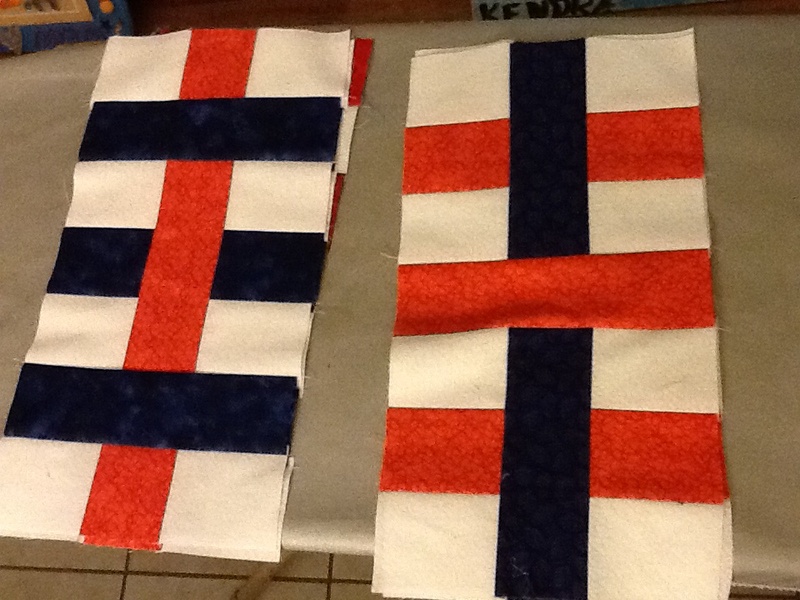 I have sewn 76 blocks, and I want 120 to make a quilt top. My love of the quilting process has led to designing patterns. You can find the details on a separate page of this website, just look for the button at the top right corner of your screen. 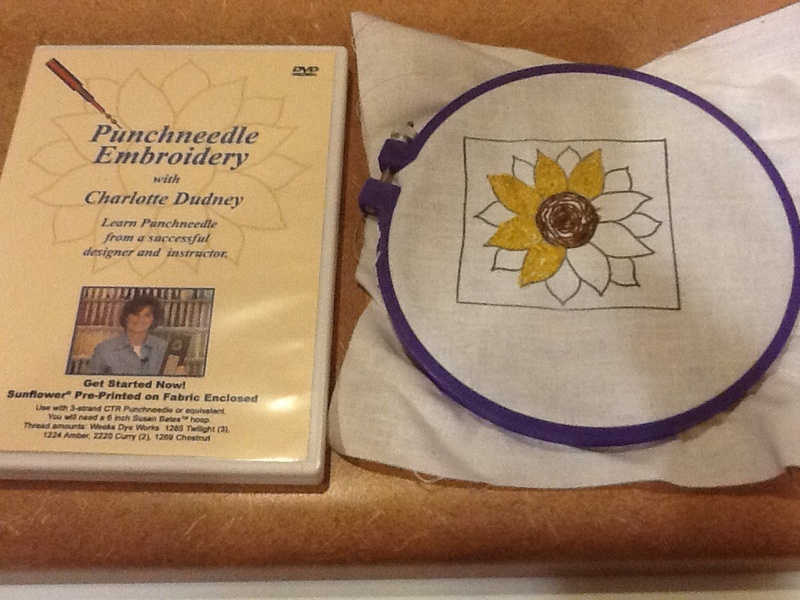 I am selling these pdf downloads through Craftsy. I hope to have several more available over the coming months. 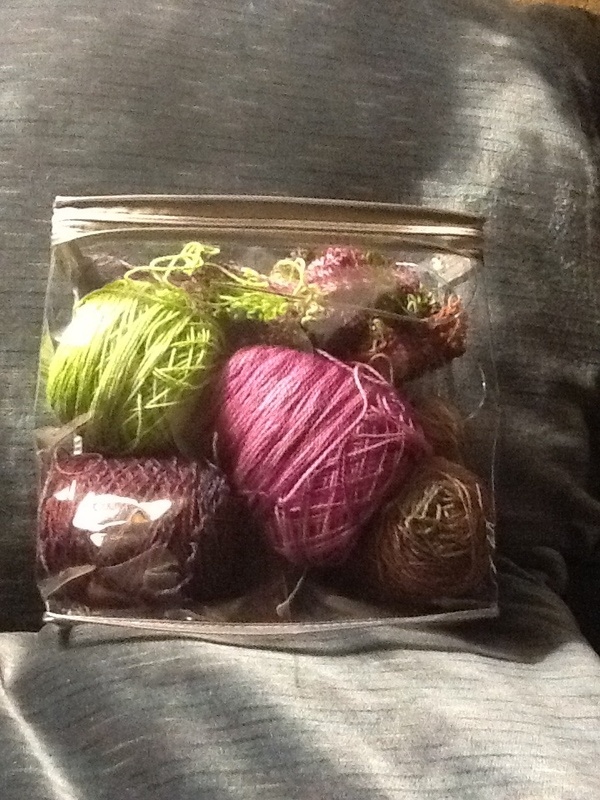 I bought my daughter new bed sheets, and the plastic case is perfect for my new knitting project! It even has an interior pocket where I can store the pattern. No, of course I didn’t finish any of my current knitting projects. I really did try to resist another mystery knit along, but when I saw the shape of Stephen West’s 2014 shawl, and contemplated my stash…he’s like the Borg – resistance is futile, you will be assimilated. Check out the ravelry group for spoiler pictures. I am trying very hard to mix in a wide variety of neutral/light fabric instead of always using white or cream. 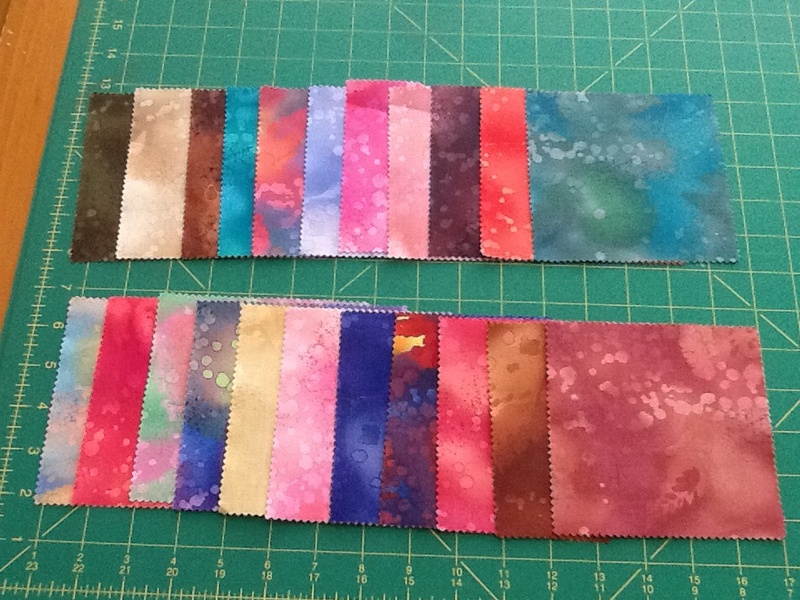 But I do like the strong contrast of dark and light, so the alternate nine patch is from my stack of “medium” rejects. Those pinks and yellows don’t play well in this project. Any suggestions on what to use them in? And if you ever want to swap a bundle of fabric, just leave a comment! The October pattern was Woven Bars. I am hoping to work on this project on my days off this month. My school district went a little crazy, and we have both Monday and Tuesday off for Veterans Day, then a whole week for Thanksgiving. Yay for quality sewing time, boo for the choppy teaching schedule. 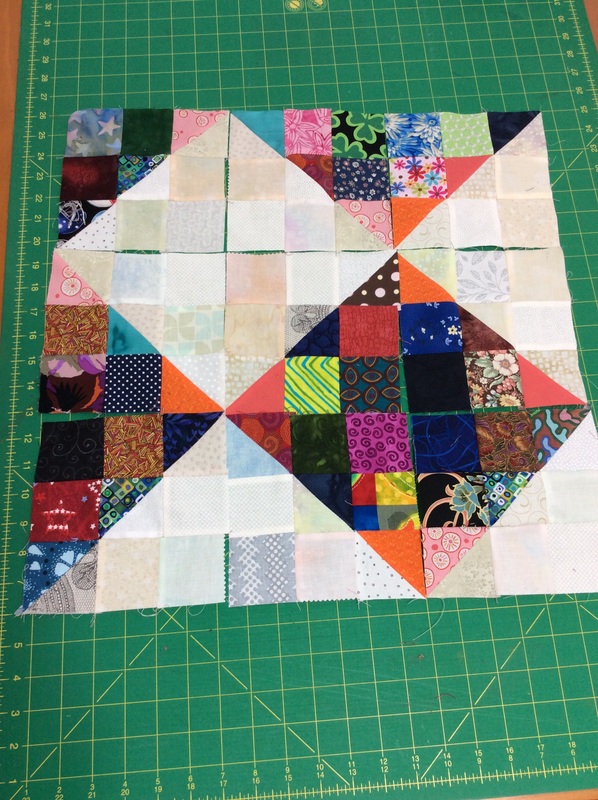 Back to the QOV plan…I had trouble with the curved piecing back in June, so I have to come up with an alternate plan for those blocks, and I missed September also. You can find all the patterns in the Block Lotto archives, using the keyword Mod Mod QAL. I recently participated in a swap and I have some extra sets! The winner will receive two identical sets of 49 squares, plus a couple odd balls to reach the magic number of 100. You can see the sets I cut for the swap pictured above. I will ship internationally. THIS CONTEST HAS ENDED. This week, I decided to dust off the book shelf. 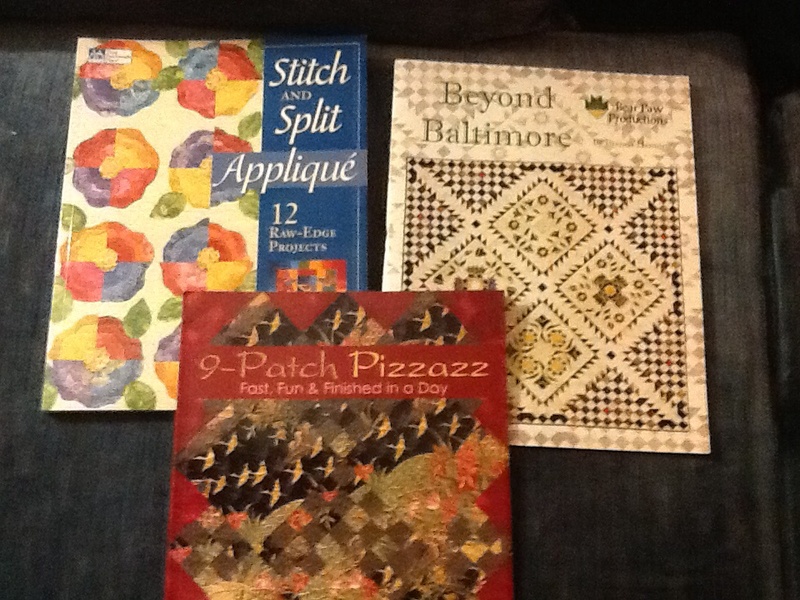 I have 9 Patch Pizzazz by Judy Sisneros, Beyond Baltimore by Brenda Henning and Stitch and Split Appliqué by Jayme Crow and Joan Segna. I hope you can give these books a new home. Just leave a comment and tell me your favorite quilting method – traditional piecing? Improv? Appliqué by hand or machine? The contest is open until Thursday Oct 23rd at 8pm PST. 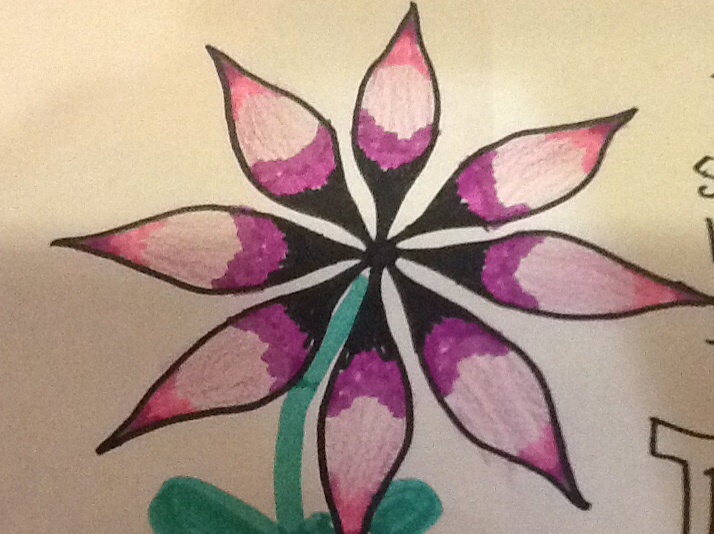 Wouldn’t that flower make a lovely needlework design?!? 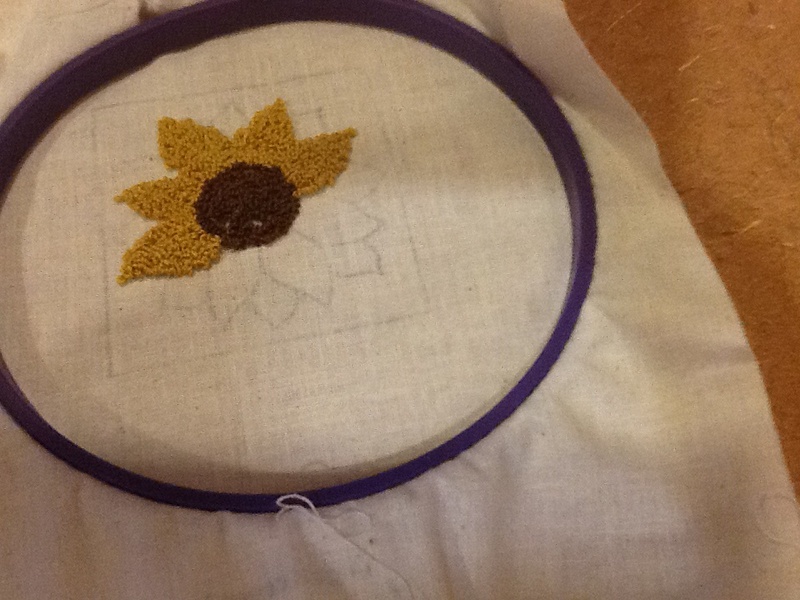 Quilting, knitting, punch needle, cross stitch – are you a monogamous crafter or multi-craftual? I dug into my stash this week and found some Fossil Ferns Charms (5″ squares). I have a set of 22 charms to give away! To enter, please leave a comment on this post with ideas for using charm squares. Do you leave them whole or slice them up into smaller bits? 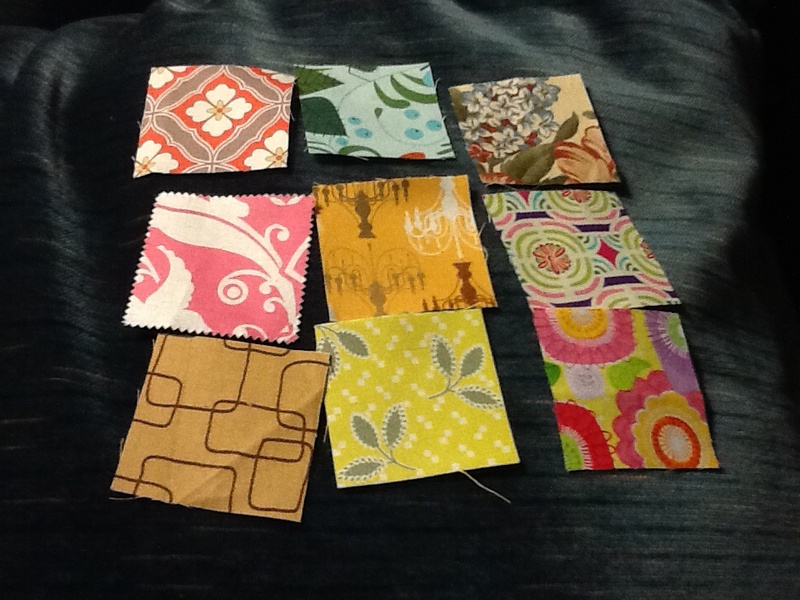 I am making scrappy blocks from 2.5″ squares, mini charms I think they are called, so I would take these straight to the cutting table! Comments have been closed. I will use a random number generator to draw a winner, who will be announced on Monday Oct 13. Good Luck!